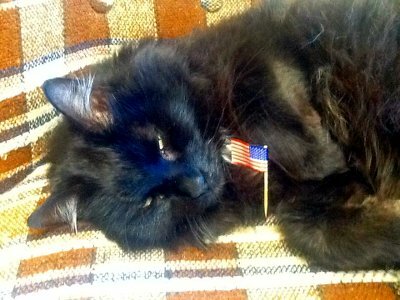 Okay, this is late for the 4th, but posing a cat with silly holiday props is time-consuming. Probably a bad idea as well, both as a photo and as a general annoyance to the cat. But, Bruno tolerated it long enough to get this one shot, so I can’t waste it. Happy Canada Day, Happy Independence Day, and congratulations to Eugenie Bouchard for a historic, but too short Wimbledon run! She’ll be back.